Lou Anders reports that Time columnist Lev Grossman has selected his new anthology Swords & Dark Magic as one of two recommended “Summer Page Turners” in the July 12th issue. Fantasy is going through an explosion of creativity. Two new anthologies showcase the best of it: Stories: All-New Tales, edited by Neil Gaiman and Al Sarrantonio, and Swords & Dark Magic, edited by Jonathan Strahan and Lou Anders. 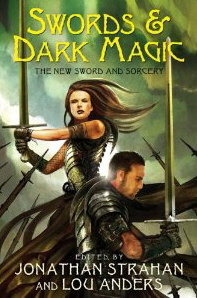 Swords & Dark Magic was published by Eos on June 22, and is edited by Anders and Jonathan Strahan. Jason Waltz reviewed it for Black Gate here. Congratulations to Lou and Jonathan on the great press. Good to see the new breed of sword & sorcery getting some national attention.